Kennedy Burke saves the ball for UCLA. She finished with 14 points and 10 rebounds. Photo by Benita West/TGTVSports1. 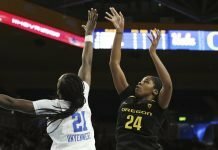 Los Angeles – The enduring image after UCLA’s last game – a Pac-12 Tournament semifinal loss to Oregon State – was of guards Jordin Canada and Kari Korver tearfully fielding questions in the post-game press conference. A different Bruin team that took the court Saturday, in their NCAA Tournament first-round match up with Boise State. This group shut down their opponents with intimidating, lockdown defense, and something that has been missing: a balanced scoring attack. 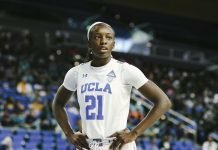 Monique Billings led UCLA with 19 points, and Kennedy Burke and Nicole Kornet each added 14, with Burke also grabbing 10 rebounds. Canada had 15 points to go with 16 assists, which tied an 18-year-old school record. Just as significant were Korver’s nine points and Kelli Hayes’ eight. It was a multi-pronged effort that had been missing – especially as conference play wound down. Billings, who has been the statistical leader for the team this season, with Canada, said getting everyone involved was a focal point in preparing for Tournament play. UCLA also worked on elevating their defense, particularly in transition. “All of our keys (to the game) were on defense, so it was a big focus for us just to be the aggressor and not let them have anything easy tonight,” Billings said. The hosts started fast, and the Broncos didn’t score their first field goal until the 5:21 mark. The Bruins pushed the pace the rest of the way, outscoring their opponents in each quarter except the third, when each team had 20 points. Brooke Pahukoa and Riley Lupfer each had 13 points for the Broncos. 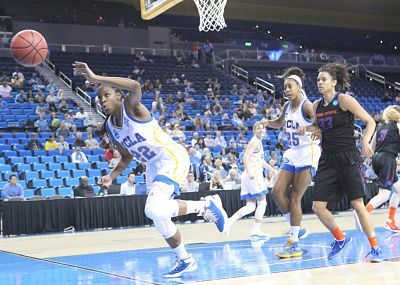 UCLA had 24 team assists, outscored Boise State in the paint, 36-17, and shot 58 percent on the game. But they were outrebounded by the visitors, 39-37. Bruins coach Cori Close said she appreciated her team’s energy, and said she knew they were going to step up after their conference tournament experience. Close has challenged her athletes more of late – especially Canada and Billings. She has told the whole team to embrace game preparation and making a play for a teammate. 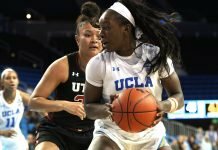 UCLA will face Texas A&M in second round action Monday at 7 p.m.